A prostrate perennial that develops into a tree and may reach 40 feet in height. Found throughout the southeastern United States along roadsides, woodland edges, in turf, and also most recently as seedlings or sprouts in many no-till crops. Plants arise from seed and stem fragments and resemble mature plants. Divided into four to six pairs of branched (pinnae) that are approximately opposite from one another and from 1.5 to 4 inches in length. Each pinnae is then further divided into 10 to 20 pairs of leaflets that are also opposite from one another. Individual leaflets are 8-15 mm long and 3-5 mm wide. With maturity, individual leaflets become tightly compacted to the point that neighboring leaves overlap one another. Contain many stiff hairs that are closely pressed against the stem (appressed). Stems are usually prostrate and creeping. Bright pink in color and occur in round heads at the ends of flower stalks (pedicels). A legume that is thin and flat, approximately 3 to 7 1/2 inches long and 3/4 to 1 inch wide. A creeping perennial that becomes woody and has leaves divided into pinnae and many smaller leaflets. 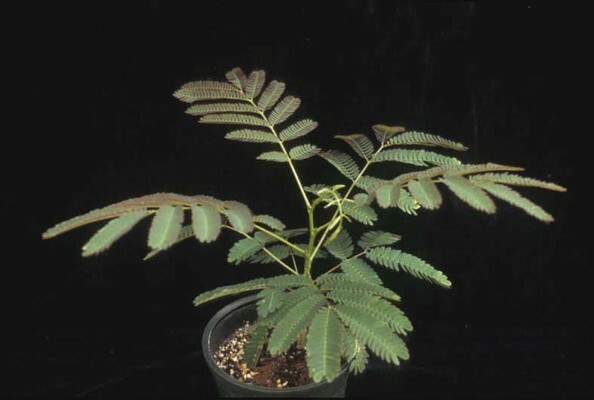 The woody habit of mimosa helps to distinguish this weed from others when mature, however seedling or sprouting mimosa plants may be confused with Hemp Sesbania (Sesbania exaltata). 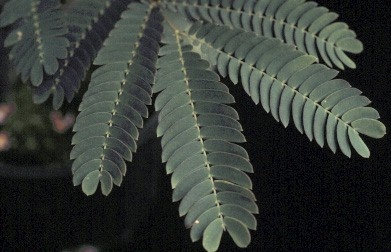 However, with maturity the individual leaflets of mimosa become tightly compacted to the point that neighboring leaves actually overlap one another. This is not the case with the much wider-spaced leaflets of hemp sesbania. 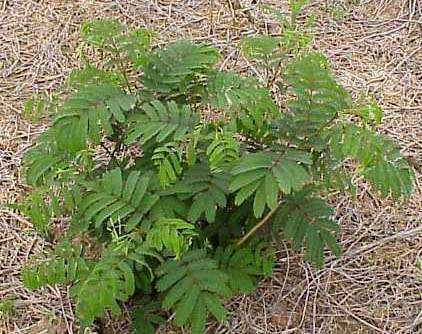 Additionally, the stems of hemp sesbania do not have hairs like those of mimosa.